New York will be a "yuuuge" state in the race for the 2016 nominations for both parties, as three out of the five remaining candidates have pretty strong ties to the state. On the Democratic side of the aisle — and worldwide — voters want to know: will Bernie Sanders win the New York primary and get closer to the nomination? Or will New York break his winning streak? The polls aren't necessarily in his favor, but there are still a fair few undecided voters in the Empire State. Some of the latest polls from New York conducted within the past month show pretty sizable portions of undecided voters. A NY1/Baruch College poll shows Hillary Clinton beating Sanders 50 percent to 37 percent; 11 percent of the 632 respondents were undecided and 3 percent declined to participate. However, things get pretty interesting towards the end of the poll. Compared with Trump, Bernie Sanders bests "He Who Must Not Be Named" by 22 percentage points, while Clinton only beats Trump by 16 percentage points. A curious fluke? Or does this potentially show that at least 6 percent of the New York Democratic electorate are holding their noses for Hillary? It's worth noting, that's for sure. Since New York is a closed primary — and unlikely to turn into an open primary anytime soon — ground game will be absolutely key in this election. Engaging disenchanted voters, getting people to the polls, and making sure that voters are educated and know their rights will be essential. Whatever campaign is able to use their resources efficiently, and mobilize the most voters, will end up triumphant in the end. 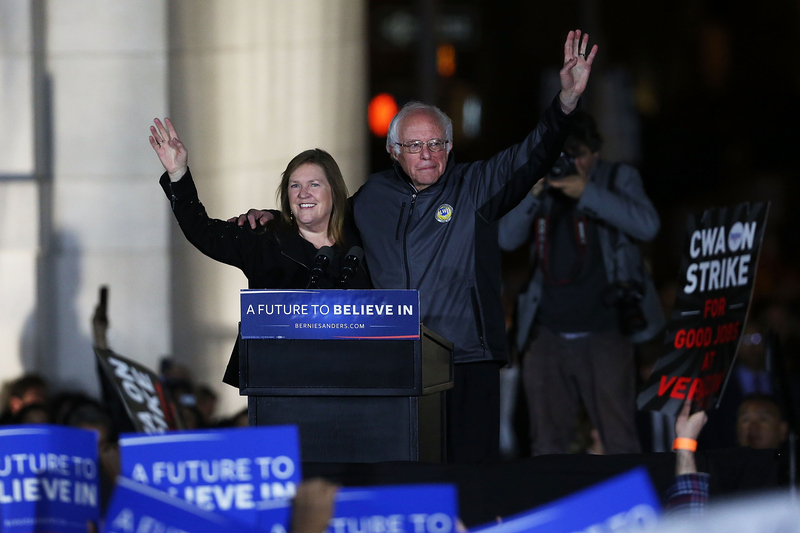 Sanders has been able to drum up large crowds throughout New York City. On April 13, an estimated 27,000 people came out to Washington Square Park in Greenwich Village, by all accounts breaking the previous record for a political rally in that space. President Obama drew an estimated 24,000 to the park in 2008 during his first White House bid. If New York ends up feeling the Bern on Tuesday, it will be because of the most dynamic grassroots campaigns in modern American history. If Sanders can win in New York, it is highly likely that he will be able to mount a convincing case for the Democratic nomination at the convention this summer, and be able to shrug off any calls for him to suspend his movement.